Priced at around $900, the Horizon T72 treadmill is the next step up from the T71 model with a larger 2.0 HP continuous duty motor and a slighter larger running area. One other difference is that the Horizon T72 has 2 small LCD screens to display data, where the T71 has one. 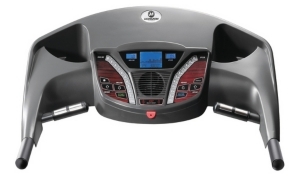 This isn’t a bad looking treadmill overall, but don’t judge a treadmill by its display panel. UPDATE: The Horizon T72 treadmill is no longer being sold. 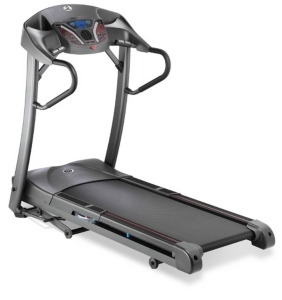 Check out the latest Horizon Fitness treadmills to find a comparable model. We wish we could report that fitness experts find good value in the Horizon T72 but that would be too much of a stretch. The 10 year motor warranty is okay, but the parts and labor warranty is good for only one year. Keep in mind that treadmill parts are expensive to replace and should be taken into consideration when buying a cheap treadmill. If owners wanted to point out the good points of the Horizon T72 treadmill, they’d likely mention that the walking area at 20"x55" is large enough to accommodate longer strides. Otherwise, there aren’t many bragging points. 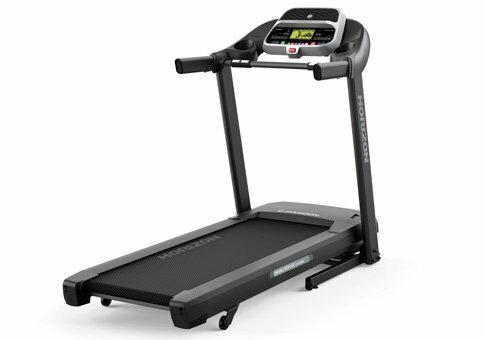 This is a lower end treadmill that doesn’t score well in quality, noise, stability, power, or warranty. A treadmill isn’t something you want to purchase every couple of years. You want it to last up to 10 years, in which case you should seriously consider spending the extra money on a good quality machine. Chances are, you're currently running on a commercial quality machine at the rec center and ideally you want that type of feel in your home gym. The last thing you want is some cheap, wobbly, noisy thing that constantly reminds you cut costs on the purchase price. Pass up the Horizon T72 treadmill and consider a better machine for your money such as the Smooth 5.25.